This antique stairlift, originally manufactured by Bison Bede way back in 1985, is still going strong and apparently hasn't been serviced for over five years, amazing! The daughter of the stairlift owner, Mrs Kapinski, asked Rental Stairlifts to call in and quote for a new stairlift replacement for her elderly mother, but when sales representative Bill Taylor called to see Mrs Kapinski she almost turned him away telling him that the old stairlift works like a dream and she had no intention of replacing it. "If it ain't broken leave well alone", she told Bill. 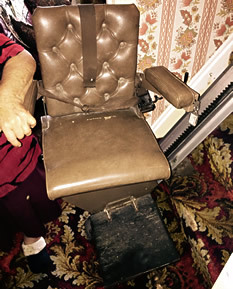 As a good will gesture, Rental Stairlifts sent out engineer Andy to check the stairlift's overall condition and, after a brief inspection, he declared it was in 'excellent working condition for its age.' Andy added: "I'm sure if modern appliances were made to the high standard they were manufactured in the old days like this old relic we would save a fortune not having to replace things." Arthritis awareness charity Arthritis Care published findings from a recent study which suggests over 70% of arthritis sufferers are enduring constant pain. Osteoarthritis is a condition that affects millions of people across the UK. The effect of osteoarthritis varies greatly from person to person but for most it�s a constant source of pain and stiffness. It can make the most trivial daily tasks a painstaking mission. Osteoarthritis is the most common type of arthritis in the UK, commonly causing stiffness and pain in the joints. When a suffered develops osteoarthritis the cartilage covering the ends of bones within the joint wears thin and the bone below often thickens. We offer stairlifts specially designed to help overcome problems associated with osteoarthritis. The stairlift comes with the latest features such as remote, easy to use controls, padded upholstery, gentle start/stop function, a swivel seat and the latest safety features. When you rent a curved stairlift solution from Rental Stairlifts, we will service it regularly and keep it in safe working order, so you don't have to worry about any extra maintenance costs. In the unlikely event that there is any problem with your rental stairlift, you can be assured that help is only a phone call away. 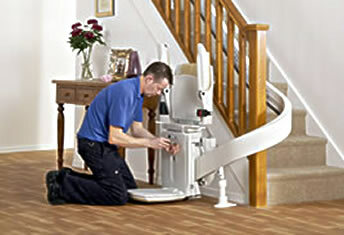 Our stairlifts can be fully installed within 2-3 working days from your free site survey. We aim to get your lift installed as soon as possible after you've made your decision because we know how important and life changing a stairlift can be. We installed Mrs. Sitwell's stairlift within 48 hours of her contacting us. Mrs. Julian in Sheffield, who suffers from back problems, and spent over a year downstairs, unable to climb the stairs, decided to rent a stairlift from us recently. She rented our Brooks/Acorn straight stairlifts, incorporating the latest technology including the 'soft start soft finish' which allows a slow gradual acceleration to prevent any uncomfortable sudden jerks or jolts. People with back problems such as spondylitis of the spine have found this facility helps them enormously "I can't thank you enough You've given me my house back!" said Mrs. Julian. Louise Duffy was facing the prospect of spending Christmas in hospital this year as she is recovering from an operation at Leeds General Infirmary and doctors were reluctant to discharge her unless her house had a stairlift fitted. But Louise's house has a complex curved style staircase, and she thought a stairlift wouldn't fit. So, Louise had resigned herself to staying in hospital over the Christmas period and missing out on all the family celebrations. However, a relative contacted Rental Stairlifts on her behalf and asked if they could help. Rental Stairlifts Sales Director John Sugden explains: "When the family explained their situation, it was clear to me that the most important thing was to have the right stairlift installed as soon as possible. And, given the complex curved staircase, the best option was to install the Brooks curved rental Stairlift. Renting a stairlift was also the best option for Louise as it fitted into her monthly budget, and allowed peace of mind regarding maintenance." Rental Stairlifts are set to celebrate 20 years of stairlift installations next year. The company began selling and installing stairlifts in 1995, and have installed nearly 10,000 over the years their first rental stairlift installation in Burnley. "I love helping people see that they can actually stay on their own homes, even if they have a severe disability," says Sales Director John Sugden. "That's what makes the job so special, especially in the case of some of our more elderly customers." Here's to the next 20 years of specialist Stairlift advice and installation! 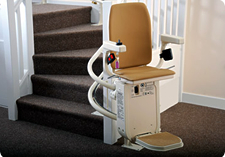 Our most popular brand new straight stairlift, the Brooks Lincoln Stairlift has had a seat redesign. The new improvements to the Brooks Lincoln bring many benefits for customers, and additional functionality. Completely redesigned with the user in mind, the new seat demonstrates a clean modern design, and a significant increase in comfort and usability. The overall size has been reduced, which, in addition to making the seat more aesthetically pleasing, allows for use on narrower staircases without any loss of comfort. The seating shape and position has been adjusted, making for a more ergonomic ride, with even greater flexibility provided for the user with the newly positioned paddle controls, adjusted to give easier access than ever before. A new website has recently been launched by Rental Stairlifts (a partner company of Sabre Stairlift Systems Ltd.) - dealing specifically with stairlifts for rent (including straight or curved stairlifts) in the north of England. The site includes information about the different models available for rent (including the Bison Classic and the Brooks New Lincoln Slimline stairlifts), as well as details about stairlifts for straight and curved staircases along with a FAQ (Frequently Asked Questions) page. Rental Stairlifts website for more information. The new product pages include photos, technical diagrams, specifications and dimensions of the machines on offer, and the company hopes that by providing this information online it will help prospective customers make a more informed decision about the type of stairlift machine - be it straight or curved - which they eventually choose. Please give us a call on freephone 0800 074 70 74, or email info@sabre-stairlifts.co.uk.co.uk to discuss your requirements and how we can help. Please give us a call on freephone 0800 074 70 74, or email info@sabre-stairlifts.co.uk. to discuss your requirements and how we can help. 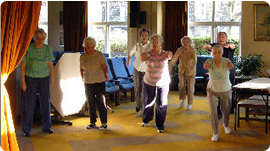 Local Stairlift Company helps Bingley OAPS get fit for life! A knock or a fall can be very serious, but if we work on stability and increased flexibility, confidence will increase, and my clients find they get a new lease of life. People can have the wrong idea about exercise, they think it might be too much for them. He continues ,'But the right exercise, at the right level, done in a safe environment can make a world of difference to the mobility of those who think their walking days may be limited. Lee's classes currently take place twice a week, and make use of simple equipment such as exercise balls, stretch bands and small weights. The idea is that a lot of the exercises can be duplicated at home, though Lee is keen to stress that would-be keep-fitters have an exercise plan designed exclusively for them, before embarking on a back to fitness routine. Lee's personalised exercise plans take account of any injuries or medical conditions, and he is a strong believer in getting fit in order to prepare for an operation, as well as in exercise being part of the recuperation process. 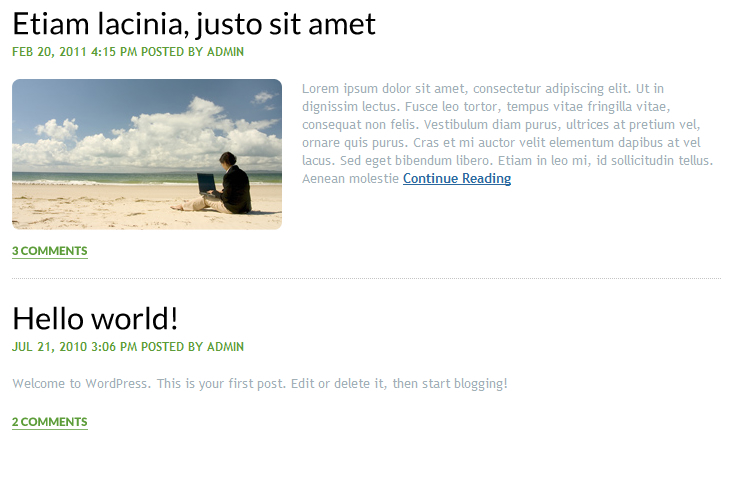 It's this attention to personal needs that gets such good results. 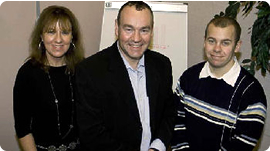 John Sugden of Sabre Stairlifts is delighted to be sponsoring these classes. 'It's made us rethink our service, he says 'We're one of the only stairlift companies with a short-term stairlift rental option, so that our clients can have a cost-effective way of ensuring they can still use their whole house even when recovering from an operation or illness. Renting can be a cost effective option, and when they're back on their feet, they can have the stairlift removed with a minimum of fuss. Please give us a call on freephone 0800 074 70 74, or email info@sabre-stairlifts.co.uk to discuss your requirements and how we can help.